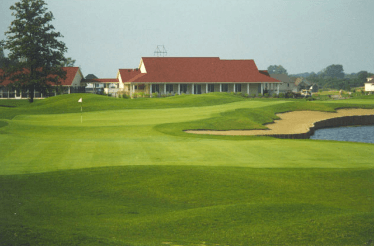 Noble Hawk Golf Links thanks you for scheduling your golf get-away to Great Indiana Golf Packages and invites you to add the convenience of an on-site meal for your group during your visit to Noble Hawk. Why travel to a restaurant or order pizza in your room when you can enjoy a wonderful meal right at the golf course? Noble Hawk prides itself on having the finest golf outing food & beverage service in the area. Our full-time Hospitality Manager along with her staff will assure the very best quality food items prepared to your requirements. Our Hospitality staff is capable of virtually any meal service you might require. Many of the meals we prepare are customized to the group’s individual taste and budget. Whether you require something simple for lunch between rounds or a meal to end your day, our staff will not disappoint. To include a meal at Noble Hawk simply contact our Golf Coordinator and she will make all of the arrangements for you. You may also contact Noble Hawk directly at 260-349-0900 and our staff will be happy to assist in designing the perfect meal for your group. We are thankful for your consideration of our club house for your special day. Our banquet facility is an ideal setting for any special event. We pride ourselves on our attention to detail and our customer service. Please consider all of our packages as guidelines as we would be happy to quote you for any custom needs you may have. Cobblestone boasts 196 beautiful acres of rolling hills terrain. The course built in 1998 and the club house remodeled in 2011. We are confident that you will find our staff pleasant to work with and passionate about what we do. We can accommodate a variety of needs and enjoy creating that custom experience with each client. From a small party to large reception we will work with you to develop the event you have always dreamed about. With an event planner on staff we have the ability to be a full service venue or offer the basics for planning on a budget. You will find that Cobblestone Golf Course and Event Center is an ideal setting for your special events. If location and ambiance are important factors to the success of your next event, then consider Autumn Ridge Golf Club. Positioned at the center of a lush 18 holes championship golf course, our magnificent clubhouse is located just moments from I-69. No matter what the occasion, formal or casual meetings, birthday parties, banquets, wedding receptions and of course our popular golf outings, Autumn Ridge provides an exciting, well-planned event. Combining our elegant atmosphere with a personal touch, our professional staff can offer invaluable assistance by providing planning expertise along with our wide variety of menu options. From breakfast buffets to an old fashioned hog roast, soup and sandwiches to prime rib, delicious dining is a matter of course at Autumn Ridge. When it comes to golf, our helpful pro can supply the experience and advice to make your corporate golf outing or fund-raiser a major success, and one they will talk about for years. For large events to small groups, cocktail parties to grand galas, there is nothing too out of the ordinary for an extraordinary place like Autumn Ridge. For more information or to schedule a time to talk to us and view our facilities, please call us at (260) 413-0910 today. We look forward to meeting and showing you the unique Autumn Ridge experience! We also have a very large banquet room for receptions, birthdays, anniversaries, holiday parties, etc. Bridgewater Golf Club offers different types of dining to satisfy all of out customer’s needs. The Bridgewater Grille is available for lunch and casual dinners. The Water’s Edge is one of the best fine dining establishments in Northeastern Indiana. A fully screened in patio over looking the 18th green and pond, and our banquet facility is second to none with seating up to 300 people. The Bridgewater Grille is perfect for a casual lunch or dinner. 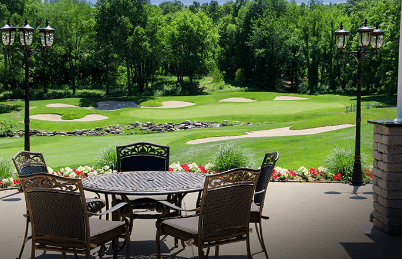 The Bridgewater Grille is an ideal setting for business meetings, lunch with a co-worker or a quick bite before or after golf. Our menu specializes in lighter meals including soups, salads, sandwiches, wraps and local favorites. The Bridgewater Grille is also the place to grab soft drinks and coolers for the golf course. Our banquet facility is the perfect place for business meetings, special parties or dinner after a golf outing. 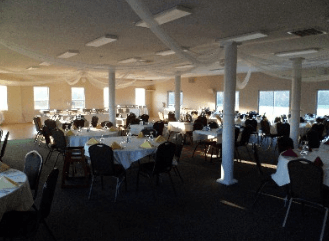 With seating for up to 300 people, our indoor banquet room can be used for large parties or sectioned off to accommodate many small groups at once. Audio/visual equipment is available for use and includes an overhead projector, pull-down projection screen, PA system and the ability to connect personal computers. Located next to clubhouse is our outdoor pavilion with seating for up to 200 people. For more information please check out the Banquet Menu section on our website, email Sean Gowthrop at: sgowthrop@bridgewatergc.com or call us at (260) 925-8004. Bridgewater Golf Club is also home to The Water’s Edge. For a fine dining option, The Water’s Edge offers a more sophisticated and intimate dining experience. Customer’s can also enjoy a warm summer evening by dining outdoors on our patio featuring a spectacular view of our 18th hole. Menu options include dinner salads, hand cut steaks, seafood, pork and poultry. In addition to our normal menu options, our Head Chef Carl Bartling prepares three specials every evening including a pasta dish, seafood special and his own feature for the evening. Add delicious food to our extensive wine and martini list and we promise a great evening!! Reservations are not required but suggested Friday and Saturday evenings. (260) 925-8004. Fully screened in, over looking the 18th hole, fairway and pond the patio provides the one of the best views for dining in Northeast Indiana! In case you didn’t know, the Grill Room is open to the public! Here you’ll find the perfect location for casual dining and informal occasions. A floor level walk-out patio extends the space. Please call 260-637-7406 for additional information or to reserve a table. What will you enjoy at the Grill Room? Our staff will gladly assist you with all the catering and accommodations for your special occasion. Please call 260-637-4364 and ask for the Event Coordinator. With a 2,600 square-foot interior, the Banquet Room can be customized to accommodate several groups or one large party. Additional space is available on the patio and tent area. The Banquet Room has full dining and bar service, and is equipped with an audio system. The banquet Room and Grill Room may be used together to accommodate a larger group. Glendarin Hills is available for any special occasion in your life: weddings, anniversaries, birthdays, business meetings, banquets, roasts and toasts. Our banquet areas are available for both private and corporate events. From the moment your guests drive up to our beautiful and spacious 32,000 square-foot clubhouse, they will revel in the lovely golf course surroundings. Click here to request more information about hosting your wedding at Glendarin Hills or call us today at (260) 624-3550. Lush trees throw shadows over velvety green grass in spring and summer or blaze with color in the fall. Winter time creates its own stark beauty. Sparkling ponds glitter in the distance. Walls of windows and spacious porches look out on the surrounding fairways and greens. Whatever your event, your guests will enjoy the ambiance. Bridal parties especially will love the chance to take photographs in these picture-perfect surroundings that they will treasure forever. Every time you look at one of these photos you will be glad you chose Glendarin Hills for your event. We have banquet facilities that can handle up to 300 guests inside the clubhouse plus a tent that can be used for another 150. Have your wedding outside under the tent and then go to the clubhouse for dinner, music and dancing. Outdoors we also have a deck for some alfresco service. Our cuisine is delicious, provided by the staff of our outstanding restaurant Caruso’s. We will work with you to customize the menu. You can have a lavish buffet with such specialties as prime rib and smoked ham. Or serve a sit-down dinner of prime rib, beef tenderloin or other luscious entrees. We can even do an Italian themed dinner if you wish. Working with our gracious staff, you will ensure that your festivities will run smoothly and successfully. We can lighten your tasks and make your party or meeting a fabulous experience. We can help you arrange special touches to suit you and your guests, including referring you to rental companies and other vendors. Be sure to book our golf course for a wedding party outing before the big day. We will ensure that every detail will be handled with care. And remember, Glendarin Hills makes the ideal spot for a destination wedding, since we’re located less than three hours away from Chicago, Detroit and Indianapolis. Your guests will enjoy a trip to the Lakes Country for your resort-style affair. Request more information about holding your next special event at Glendarin Hills or call us today at (260) 624-3550 to book your tee time. Located at the world-class Island Hills Golf Club, The Grille Tavern is one of Southwest Michigan’s premier restaurant destinations. The Grille has an all-new menu that focuses on using the best possible ingredients to bring you a fresh, sophisticated flavor that’s simply amazing. Many of our dishes are prepared with local produce and herbs to ensure the best tasting recipes come to life. The Grille Tavern is open daily for dinner. What Makes the Grille Tavern at Island Hills So Special? Shortly after opening outdoors in 2010, The Grille Tavern became one of Southwest Michigan’s premier restaurant destinations. Sure, the locals love “The Grille”. But out-of-towners drive from Kalamazoo, Battle Creek, Grand Rapids, Fort Wayne, South Bend – and beyond – simply to enjoy an out-standing experience at The Grille Tavern. The Grille Tavern is a feast for your eyes. Located just south of Centreville, this unique restaurant is perched high on a hill in some of the most scenic country in Michigan. Diners can enjoy an elevated view of Lake Templene complete with occasional sightings of deer and other local wildlife. Here, you can order off the full menu or treat yourself to a hand-crafted pizza baked in our in-house pizza oven. Our professional chefs have crafted a menu that combines classic American favorites with the local cuisine and offers occasional surprises. The result is a mouth-watering selection of lunch and dinner items. Lake Templene boaters can place orders by phone, pay by credit card, and pick-up their orders at The Grille Tavern pontoon docks. "​WHERE GOLF & HOSPITALITY MEET"
SEO - Pinnacle Marketing Management Inc.